A 1925 Duncan & Co. Glasgow cigarette insert card. This stunning unnumbered card is entitled S.S. Titanic from the "Evolution of the Steam Ship" series. The very colorful card measures 2 1/2" x 1 1/2". Issued in 1940 by the R. & J. Hill LTD, this 2 1/2" x 1 1/2" gloss front card from the "Famous Ship" set is #36 and is simply labeled "Titanic." The back of the card gives a 4 paragraph history....obviously in small type. Another card from Cadbury's but not quite as scarce and valuable as the pre-sinking card and certainly more modern. This is #17 from the 1970 "Strange but True" set. 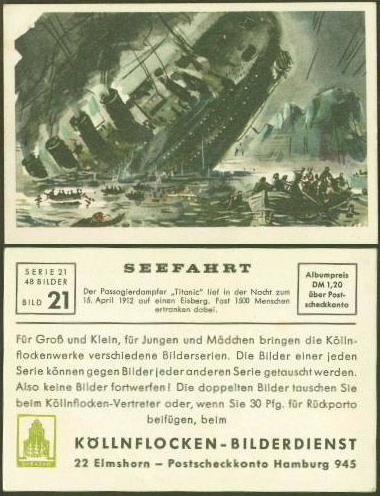 Although it shows a picture of the Titanic sinking on front, the primary topic and story on back of this card is "Icebergs Can Kill." It is in mint condition and is almost 3" long. Issued in Germany in the 1930's(?) this is part of a set titled "Seefahrt" (Seafaring or Sea voyages) and was to be placed in an album. On the top of the back it basically says "The passengership 'Titanic' sinks in the night of 15 April, 1912 after hitting an iceberg." The rest of the back tells how to order the album.